If you have no idea what a dishwasher drawer is we don't blame you. Dishwasher Drawers are relatively new to the appliance market. Fisher Paykel (owned by GE Appliances, now Haier) invented the "DishDrawer" and released it around 1998. After a few hiccups with quality and service, Fisher Paykel dishwashers are now incredibly reliable and efficient. In this article you will learn how to choose a drawer dishasher to fit the way to clean your dishes. We even prepared a video with great visuals to help you make the best selection for your home. PRO TIP - Make sure to contact our staff at (888) 714-4938 to inquire about unpublished savings on Fisher Paykel dishwasher drawers. Why Choose a Dishwasher Drawer? Energy Efficiency - Fisher Paykel dishwasher drawers can run simultaneously or independently based on the need. If you feel guilty about wasting water and energy running a half empty dishwasher that is no longer a problem. Versatile - Dishwasher Drawers give you the capabilities of two dishwashers in one unit. If you entertain a lot, we have seen customers serve appetizers and drinks and fill one drawer and then fill the other drawer with pots and pans after dinner has been served. After dinner unload the appetizer drawer and fill with dinner plates. Gone are the days of hand washing dishes after everyone has left since there is not enough room in the dishwasher. You have many design options with dishwasher drawers. You can use a full size 2 drawer unit or get a single drawer or place 2 drawers next to each other. 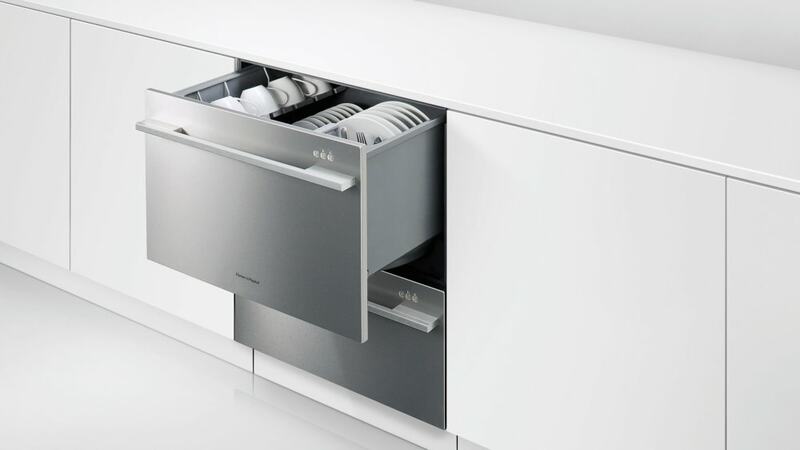 Quiet - Fisher Paykel has designed their dishwasher drawers to be extremely quiet (at or below 45 dB). In addition to having a quiet noise rating during the wash cycle, the water pump and drain pump, usually the loudest parts of a dishwasher, are engineered to run far quieter than the competition. We covered most quiet dishwashers in our earlier blog post. Which Dishwasher Drawer Should I Buy? If you are tired of lingering dishes in your sink, you may find Fisher Paykel drawer dishwashers handy. Single drawers save space in a tight urban kitchen as it will allow you to have cabinet space under the dishdrawer. On the other hand, double drawers will allow you to run each drawer independently to save valuable sink and counter-top space. All Fisher Paykel dishwashers are energy efficient and use less than 4 gallons of water per wash cycle. You will notice the interior of the dishwasher is not stainless steel, rather a custom molded plastic. When we asked our contacts at Fisher Paykel why the interior was not stainless steel we received an interesting response. Fisher Paykel molds the interior of their dishwashers to reflect water at just the right angle so that every dish is cleaned. This in turn makes more room in the tub to fit large size plates as there is no need to have a spray arm on the top of the tub. At this time, the particular tub can only be made using custom molded plastic. Also, Fisher Paykel found that water bouncing off of stainless steel is louder than water bouncing off of plastic in a drawer setting. Fisher Paykel drawer dishwashers have been in the US market for the past 20 years. As much as we love these products both in terms of form and performance, we noticed that manufacturers' catalog is cumbersome and not easy to follow. Below you will find a quick breakdown of the product line to help you choose the perfect dishwasher drawer for your home. At this time, Fisher Paykel only makes dishwasher drawers. In case you are eyeing a standard dishwasher please check out our latest dishwasher buying guide. Double Drawer Dishwashers have the same dimensions as traditional dishwashers. This makes swapping one for another effortless. Some people refer to these dishwashers as "two drawer dishwasher" as each drawer can operate independently or simultaneously. Fisher Paykel makes four different series of double drawer dishwashers. Standard height DishDrawers can be adjusted between in height from 32 5/16" and 34 5/8". 32 5/16" will fit under even the shortest counters sometimes found in older homes. Tall Tub Dishwasher Drawers share all features of the regular height units but are slightly taller to allow for larger plate sizes (13" Large Plates). They still fit under a standard counter. Their height can be adjusted between 34" and 36 3/8". Taller height (34"-36 3/8" adjustable) fits place sizes up to 13"
If you live in an area with hard water (such as Northern New Jersey) a dishwasher with a built-in water softener can greatly improve your washing results. This dishwasher includes a salt dispenser in order to alter the pH level of your water for optimum washing conditions. Single DishDrawers are very unique and offer just the right amount of wash capacity for smaller households or if you are trying to preserve storage space in your kitchen. Taller height (17 7/8") fits plate sizes up to 13"
Is a Dishwasher Drawer right for me? Ultimately this is a question of personal preference. At Designer Appliances we think the Fisher & Paykel DishDrawers are extremely versatile and offer functionality you just can't get with a traditional dishwasher. If you like to run your dishwasher every day but feel guilty not running a full load, a dishdrawer will give you the piece of mind that you are saving water and energy. If you have a small home and want to save space this unconventional dishwasher might be just want you need make your space functional. If you have any questions our would like to make a purchase, view our entire Fisher & Paykel Drawer Dishwasher collection. How can I get a Bosch drawer dishwasher? At this time Bosch does not make drawer dishwashers. However, Bosch dishwashers are known to be ultra quiet and have superior cleaning performance. We cover Bosch dishwashers in our blog posts and keep the information up-to-date with ongoing product changes.